Jerry Buck’s new novel digs into the mystique shrouding the lives of Hollywood’s biggest players. Former Associated Press columnist Jerry Buck has seen it all. In New York, he covered the birth of cable television, the videocassette, the growth of political reporting, the end of cigarette advertising and the constant death and phoenix rebirth of drama, comedy and reality TV. In Los Angeles, he covered virtually every star, show, writer, director and producer – as well as their feuds, achievements and scandals. 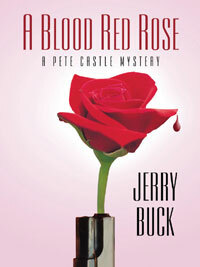 “A Blood Red Rose – A Pete Castle Mystery ,” is Buck’s new novel about what he saw and heard and reported, as well as that which couldn’t appear in print. At its heart is the romantic, atmospheric mystique that shrouds the lives of Hollywood’s biggest players. Jumping from non-fiction to fiction is something Buck has witnessed before; friend and former AP colleague Thomas Harris authored “Silence of the Lambs” and other Hannibal Lecter novels. The result is a page-turning novel that reads like art imitating life. Movie idol Jack Newhall is murdered at his famous Deauville mansion during the wrap party for the movie “Love’s Lonely Quest.” For the next four decades the unsolved murder bubbles in a cauldron to become a legend – providing fodder for countless theories, a ratings booster for television stations, and a cottage industry for a self-appointed Hollywood guru who claims to be in contact with Newhall’s ghost. Things turn deadly when producer Clark Kester asks screenwriter Pete Castle to write a script for a television reality program recreating the murder. Kester dies during a rehearsal in exactly the same way on the site of the original murder. As Pete races to solve the ancient murder – and prevent more from happening in the present – he finds arrayed against him all the forces of Hollywood. As with solving crimes, getting novels into print also takes time and dogged perseverance. Things changed a year ago when Buck’s agent suggested he e-mail an editor with a particular novel. “I sent it, and he said it was very good but wasn’t a mystery, it was suspense. So I told him, ‘I have a mystery,'” Buck says. Buck sent the mystery and “A Blood Red Rose” finally found a home. And, Pete Castle – screenwriter – made his debut as Hollywood’s newest sleuth. In addition to lots of practice, becoming proficient in different writing mediums means paying attention and fine-tuning listening skills. Through his interviews with novelists like Norman Mailer and Sidney Sheldon, Buck picked up advice he later applied to his own writing. It also takes time, says Buck, to unlearn newspaper writing. Mysteries present their own set of challenges. If you don’t know “whodunit” when you start the novel, you’re in big trouble, Buck says. One has to know how the book begins and ends, and have some vague outline somewhere between the two. Buck calls “A Blood Red Rose” an irreverent look at a very complicated business. A Blood Red Rose is now available in bookstores and at online retail sites including Amazon.com. This article first appeared in the Weekender on April 15, 2004.